lotteries composed of seven dice, which notwith­standing the vigilance of the police, are still to be found at country fairs and on race courses. These lotteries, for the mean numbers only, hold out an advantage inferior to the sum staked, while, on the other hand, they present the glittering tempta-tation to the uninitated of a large prize for the extreme numbers, which almost never come up, for to shew the ruinous nature of these schemes, it will be only necessary to state that the odds of throwing a raffle with seven dice are 40,000 to 1, while the value of the prize is not the sixth part of the risk. A thorough knowledge of the above rules is in­dispensable at the games of Hazard and Backgam­mon, and will enable the player to calculate with rapidity all the various chances they present. 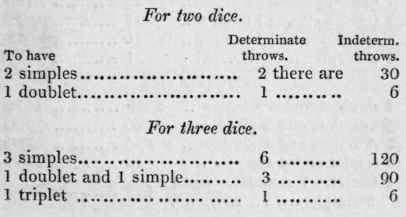 A Table showing the Number of Throws upon any Number of Dice, from 1 to 9 inclusive.